Today is the first day of the Fancy Food Show in San Francisco. I'll be attending it and related events over the next few days. 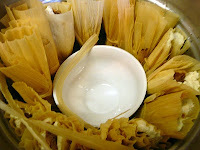 Look for my tamale party write up (with recipes for the fillings and a NEW posole recipe, too) and my dispatches about the food show. In addition to the above, I have some other, new recipes to post as well as some of the items I promised here. Your tamale wrapping party sounds like a blast. Please tell me you celebrated the end of the day by eating some! Yes, we ate them at potluck with wrappers and spouses afterwards and everyone went home with a supply, too.